Before she had an eating disorder, twelve-year-old Riley was many things: an aspiring artist, a runner, a sister, and a friend. But now, from inside the inpatient treatment center where she's receiving treatment for anorexia, it's easy to forget all of that. Especially since under the influence of her eating disorder, Riley alienated her friends, abandoned her art, turned running into something harmful, and destroyed her family's trust. If Riley wants her life back, she has to recover. Part of her wants to get better. As she goes to therapy, makes friends in the hospital, and starts to draw again, things begin to look up. But when her roommate starts to break the rules, triggering Riley's old behaviors and blackmailing her into silence, Riley realizes that recovery will be even harder than she thought. She starts to think that even if she does "recover," there's no way she'll stay recovered once she leaves the hospital and is faced with her dieting mom, the school bully, and her gymnastics-star sister. 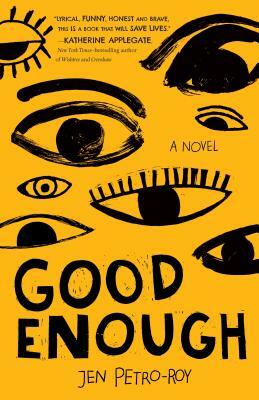 Written by an eating disorder survivor and activist, Good Enough is a realistic depiction of inpatient eating disorder treatment, and a moving story about a girl who has to fight herself to survive. Jen Petro-Roy is a former teen librarian, an obsessive reader, and a trivia fanatic. She lives with her husband and two young daughters in Massachusetts. She is the author of P.S. I Miss You, Good Enough, and You Are Enough: An Inclusive Guide to Body Image and Eating Disorder Recovery. Jen is an eating disorder survivor and an advocate for recovery.